"There is nothing that is more important than deployment of broadly interoperable authentication," he said. "It is a priority for me; it is a priority for DHS; and it is a priority for the administration." CBS4 in Florida asks, What's in a Real ID? "Florida is one of 11 states that embraced the program. 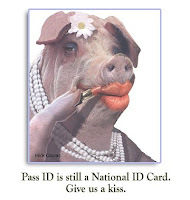 Fifteen states in all have adopted REAL ID." The Department of Homeland Security estimates it will eventually cost nearly $10 Billion to implement "REAL ID" nationwide. The line of private companies lining up to cash in and get some of that public money gets longer all the time. According to the Senate Office of public records, the numbers of clients lobbying to get business from the US Department of Homeland Security skyrocketed from 15 companies in 2001 to 883 last year (2009). 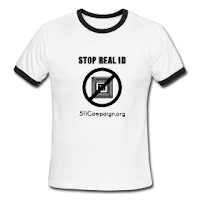 One of the leading companies that is benefiting from the REAL ID Act is L-1 Identity Solutions, an international created in 2006 by businessman Robert LaPenta, headquartered in Stamford, Connecticut. Business records show that one month after President George W. Bush signed the "REAL ID" Act into law, LaPenta established L-1 Identity Solutions. According to several annual reports for L-1 Identity Solutions, the company has been immensely successful. This year, Florida's Department of Motor Vehicles alone awarded L-1 Solutions a 5 year contract worth $56.9 Million. "Senate #TSA oversight hearing tomorrow, 11/17.http://is.gd/h9bzZ I've called my senator (& my airline), have you?#privacy"
Transportation Security Administration Oversight Hearing next Wednesday. Please forward this information as widely as possible. Contact the communications director to find out more information about the meeting. The committee chair is Sen Jay Rockefeller (D-WV) phone (202) 224-6472. The ranking member is Sen. Kay Bailey Hutchison 202-224-5922. The subcommittee chair is Sen Byron L. Dorgon (D-ND) phone (202) 224-2551. The ranking member is Sen Jim DeMint (R-SC) phone (202) 224-6121. Regardless of your home state, call the chairpersons to ask whether recent TSA abuses are on the agenda for the oversight hearing. Ask to speak with the staffer responsible for dealing with issues related to the Committee on Commerce, Science and Transportation. Here is a list of committee members, their homepage and phone number. If one of these people is your Senator, please also phone them, either at the number below or look online to find their nearest local office - you can even visit in person. A constituent who knows a senator's committee assignments and addresses issues for the agenda for a scheduled hearing gives him/herself an educated and powerful voice. If none of these people is your senator, contact the committee chairs. Also contact your own senators and representative . They still need to hear your opinion, it's just that they won't be at this hearing. This link has information on committee staff, as well.